Kyle Arsenault, CSCS, is a strength and conditioning coach and human performance specialist, author, and former intern of the renown Cressey Performance. Now working with Momentum PT and Performance Training in Milford, MA, Kyle specializes in combining principles of physical therapy with strength and conditioning to create results oriented programs for Momentum Athletes, as well as his online clients. For more about Kyle, visit his website, check out his book, The Other 23 Hours, and follow him on Facebook. 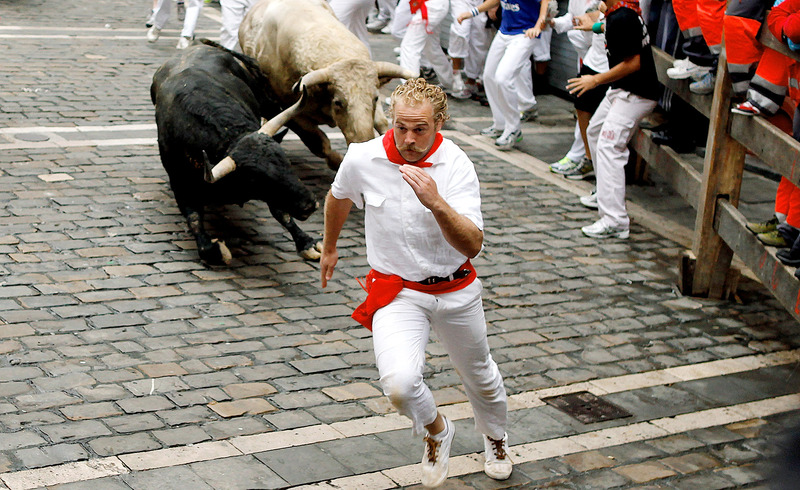 Well, if you want to increase metabolic response, accrue lean muscle mass, gain speed and quickness, enhance rotational power, jump higher, lift heavier, dominate life and sports and have a greater chance of surviving a shot at running with the bulls, then YES, you should be sprinting! But not everyone is fit to sprint…YET! Before reaching explosiveness, you must make sure that your body is cleared: you have 1) adequate mobility and stability and 2) adequate strength in the structures that allow us to produce and transfer force explosively (muscles, tendons, ligaments, fascia, etc.). Once the proper work up is completed, you can, and should, be sprinting. Is your body ready to sprint? To test whether or not you are “cleared” to sprint, try using a few variations of movements from the FMS. Active Straight Leg Raise: Lie on your back and keep one leg straight on the floor as you lift the other leg (keeping it straight with the toes pointing toward the ceiling). If you cannot get the knee of the moving leg past your down knee (**without the body/hips rotating), you are not a good candidate to sprint…YET. Lunges: If you cannot lunge without losing your balance or having your spine and hips deviate from neutral (you bend forward, overarch your low back, or allow your hips to drop or rotate), you should not be sprinting…YET. By correcting the straight leg raise, you’re ensuring adequate mobility and stability of the core and hips. Sufficient hip separation (flexing one hip while extending the other) is critical for sprint performance as well as injury prevention. Leg Lowering: Using a table, bring both legs straight up and place them on the table with your back flat on the ground. Next, without allowing your body/hips to move/rotate, slowly lower one leg to the floor, keeping both legs straight and toes straight towards the ceiling. Repeat for reps (about 10-20) and repeat on the other side. Leg Raise With Band: Next, using a band that is safely secured, lie on your back so the band is above your head. Grasp the handles of the band and bring your back flat to the floor by engaging your core as you pull the handles to the side of your body (to the floor). Next, raise one leg as high as possible while the other leg stays on the ground (keep both legs straight). You are trying to at least get the knee of the raised leg past the knee of the resting leg (further if you can). Perform 6-8 reps per side. Finally, retest the straight leg raise without table or band. If you can now get your up knee past your down knee (on both sides) you are cleared to move on. Get the glutes doing most of the work rather than the hamstrings/adductors. Cook Hip Lift: Laying on your back, bring your heels towards your glutes by bending your knees. Next, keeping the core engaged, lift one knee towards your chest and grasp hold of that leg. From this position, drive the heel of your down leg into the ground as you squeeze your glute and bridge your hips towards the ceiling. You should be able to achieve a straight line from your knee to your shoulders while using the glutes to do the work (not feeling the work in your hamstrings or low back). If you are feeling the work in the hamstrings, try pushing the heel down and away. Lower the hip back to the floor and repeat for 8-10 reps before switching legs. Wall Glute ISO March: Next, from a standing position, support yourself on a wall achieving a “sprint start” angle. Keeping one leg straight and bring the opposite knee to 90 degrees as you push the heel of your down leg through the floor as you engage the glute. Do not allow the low back to round or overarch and do not allow the down hip to push forward excessively. Hold that position for a few seconds activating the glute before switching to the other leg. Repeat for 8-10 reps per leg. If you cannot yet complete the clearing or activation exercises correctly, this is where you need to stay (along with a proper strength program) until you can correctly and sufficiently complete those exercises. Then you can move on and incorporate the following before sprinting. Perform a circuit of forward, reverse, lateral and walking lunges and then move into skipping patterns (regular, lateral, etc.). You should be able to complete these movements 1) without losing your balance 2) while keeping your hips, knees and ankles in line (“stacked up”). *Note: I would suggest performing a quality resistance training program for at least 4 weeks to ensure adequate tensile strength of the muscles, tendons, ligaments and fascia. Incorporate movements such as squats, deadlifts, lunges, push-ups and row variations. Now that you have ensured that you are cleared to sprint, it’s time to start! Although you may be mentally ready to go all out with your first sprint session, ease yourself into sprinting to reduce your risk of muscle strains or other injuries. Try performing 1-2 sprint sessions during the initial weeks starting with 10-20 yard starts at about 80%. You can complete 5-15 minutes of these sprints, walking back to the start each time. As time goes on and you become more comfortable, increase your frequency of sessions (2-3 sessions), the distance of the sprints (30, 40, 50 yards, etc.) or the time (10-25 minutes, etc.). Try progressing one variable at a time, eventually increasing all three variables as you become stronger, can handle more volume, and are able to recover quicker. You can also add variations of sprints such as side starts, back pedal starts, push up starts, shuffle starts, etc. The most important thing to remember is to listen to your body. If you are constantly sore, seem to lack energy, or start to experience signs of excessive overreaching (irritable, loss of appetite, difficulty sleeping, etc.) you may need to back it off a bit to allow the system to recover. Adding sprints to your training will take your fitness and performance results to the next level. Going through the steps above before a sprint session will help to ensure you are “cleared” and activating the right muscles, as well as properly warmed up. This will allow for a higher quality sprint session, better results, and a decreased risk of injury. So get ready, get set, and if you ever find yourself in Spain during the running, you will be thanking me for this information…hopefully!